posted by Jessica on May 24th, 2013 | Welcome to our Team, Bryson! At MFX we are pleased to welcome a new member to our team. Bryson McLachlan is interning at Machteld Faas Xander this summer to facilitate Design Thinking projects with Rebecca. Raised in the Yukon and currently being educated in Ontario, Bryson just finished his third year of Knowledge Integration at the University of Waterloo. Passionate about design thinking and collaboration, he has garnered practical experience through the Shad Valley summer enrichment program and the creation of a museum exhibit for the Knowledge Integration Exhibits project. Bryson has been working with Rebecca on two different projects. The first project involved working with the City of Waterloo staff to help City Council identify its top priorities for Uptown Waterloo. Thirty-one distinct project areas were presented to the Mayor and Council in a facilitated session. Mayor and Council rated each one on a matrix of low-impact to high-impact and low-effort to high-effort. The top eight projects will be implemented in the City’s plans for Uptown in the years to come. The second project involves working with the Guelph Region and Waterloo Region to facilitate the completion of the Ontario Ministry of Research and Innovation’s Self Assessment Workbook. The goal of the project is to better understand the current entrepreneurial ecosystem in Ontario, define challenges facing entrepreneurs, and map regional assets and develop ideas and actions to enhance regional collaboration. At this point, facilitation sessions have been held with representatives from both regions. The Ministry will receive and review the workbooks before the Provincial Workshop on June 12th and 13th, an event that MFX facilitators been invited to attend and help facilitate. More sessions are planned in mid to late June to complete the Regional Self-Assessment Workbook. Bryson is looking forward to seeing how the theory behind design thinking is put into practice in the real world. He is enthusiastic to apply the skills learned in KI to best facilitate his current projects. We are all excited to have Bryson join our team and eager to work with him in the upcoming months. The winners of the 2013 Moonshot Awards were announced on May 14th, 2013 and we are thrilled to announce that Axonify Inc. has been named as the Digital Media Globalizer of the Year. Presented by the Canadian Digital Media Network (CDMN), the Globalizer of the Year award aims to recognize a company that demonstrates the greatest increase in international sales, investments, or other contributions to the Canadian digital media industry. We are especially proud of Axonify’s accomplishments as it was founded by Machteld Faas Xander’s very own John and Rebecca. Based out of Waterloo, Axonify’s mission is to provide corporate education to employees in a way that is engaging, fun, and meaningful. Their software, built on principles of behavioral learning, is designed to reflect and keep up with the dynamic nature of the business world. Axonify works to help companies meet their financial goals by providing easy –to-use, personalized learning tools to employees. Other big winners were Magnet Forensics Inc., Miovision Technologies, and Desire to Learn. This was the inaugural year of the Moonshot Awards, which were created to recognize Canadian companies contributing to Moonshot’s goal of having anyone be able to do anything online by 2017. For more information about Axonify visit their website here. At Machteld Faas Xander, “Sharing Authentic Stories Makes our World a Better Place,” is more than just our motto or a saying that we throw around; it is our reason for being. We repeat and share this thought often because it is at the core of everything we do here at MFX. Because of this background, we are deeply interested in communication and how individuals and brands tell their own unique stories. One key area of interest involves people in our region who are a part of different communities, as well as those that speak different languages, tell their stories. One of our MFXers, Jessica, has recently started learning American Sign Language (ASL) to communicate and volunteer in the Deaf community. She has been sharing her experiences at our daily Stand-Up. We wanted to share her story because we think her personal efforts are making the world a better place! Previous to my recent experiences, I knew virtually no ASL. I could finger spell my name and awkwardly stumble through 70% of the alphabet but that was the extent of my signing ability. I had been exposed to some ASL but hadn’t serious considered learning the language myself. Six months ago, my husband and I heard that a free ASL course was going to be held in Cambridge to help teach the Deaf about the Bible. We decided to put in an application to join the class. Growing up, I had assumed that the Deaf would enjoy reading in English but was surprised to learn that this is not the case. Although some can read English, especially if they lost their hearing later in life, the majority find reading English difficult because it is not their primary language. ASL is not simply gestures or a visual form of English. ASL (and other sign languages) is its own language, with different grammar, expressions, and sentence structure from English. I was also surprised to learn the complexity of ASL. Although the basics are easy to grasp, it is considered to be one of the most difficult language to master, along with Chinese and Arabic. Secularly, it is considered an eight-year-language, meaning that it takes eight years of study to become fluent. Honestly, I was intimated after hearing this. In February, we were accepted into the course and classes started at the end of March. We were excited but nervous. The class is an extremely accelerated ASL course that lasts five months. Each Saturday, we have a two-hour class along with the other 26 students plus approximately 5-10 hours of homework per week. In addition to this, every week we attend two ASL meetings (with absolutely no English) that are two hours in length each, and volunteer with the Deaf community between 6–16 hours. The meetings and volunteer work also require preparation that can be lengthy. I am now five weeks into the class and although it is difficult and sometimes overwhelming, I am thoroughly enjoying this unique experience and am completely committed to the program. I’ll keep everyone updated on how my new means of communication and story telling is progressing in the upcoming months. As a related aside, after years of hard work, time, resources and energy sacrificed by willing volunteers, the Bible is now being made available in full ASL (along with 62 different sign languages) in video format and is available to all, free of charge, on the website: www.jw.org. People are being asked to share this information with friends and family who may know Deaf members of local communities to let them know that this provision is now available. 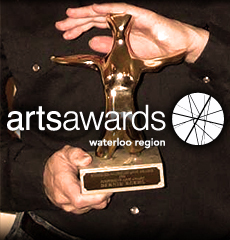 Sunday, May 26, will mark the 25th anniversary of Arts Awards Waterloo Region. Culture and arts enthusiasts from across the Region are counting down the days until this milestone event. This year, the ceremony and performances are being held at the Centre in the Square. Doors open at 5:45PM with the Arts Awards presentations beginning at 7:15PM. They have rolled back ticket prices to $10.00 in honour of the 25th anniversary and 1990s pricing. 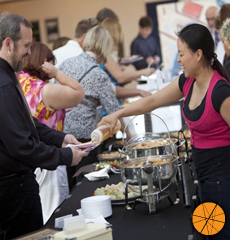 This remarkable steal of a deal also includes food tastings in the lobby from 8 delicious caterers. Everyone here at Machteld Faas Xander is eagerly anticipating this memorable night and we hope to see you there! For more information and to buy tickets, check out the Arts Awards Waterloo Region website. Lately, there has been more than the usual amount of cat talk around the office. The culprit behind this welcome change is no other than N2 the Talking Cat. N2 is an Internet star who embarks on adventures, creates music and even brings attention to social issues through episodes of his YouTube channel, created by our friend, Clayton. Clayton is the latest trainee in our Social Media Fun-Damentals in Business program. He, however, is no newcomer to the world of social media. N2’s YouTube channel has 12 000 subscribers and his Facebook fan page can boast over 31 200 likes. One of N2’s videos even has over 1 800 000 views. All this talk of furry friends gave us an idea for the May Storytelling Contest. We had such a great response with March’s winter photograph submissions that we wanted to hold another storytelling contest that featured photographs and visual stories. During the Month of May, we want you to send us a photograph of your pet. Is your animal friend beautiful, loving, smart, hilarious, quirky or adorable? Send us a photograph that best shows their personality and you could win $100. Any and all pet pictures are welcome. Tweet (@MachFaasXan) or e-mail (Jessica@machteldfaasxander.com) the photographs before May 31, 2013, to be entered into the contest. Our favourite will receive a prize of $100.00. The winner will be announced on June 3, 2013. We will post your pictures on Pinterest and Facebook. Images that are submitted through Twitter will be retweeted and images submitted through e-mail will be tweeted. If you include your full name with your submission, we will credit you as the photographer. With your photograph, we encourage you to include description or the story behind your photograph but it is not required. • You must have taken the photograph yourself. • Photographs must feature a household pet. • Photographs must be appropriate for all ages. • You may submit more than one image. • Winner must respond within 48 hours after we contact you. • Winners will be contacted via the medium used for submission. • Submitting photographs shows that you agree with these rules and that you have given us permission to post the photographs on our social accounts. If you haven’t already, check out N2’s videos or connect with him on Facebook and Twitter.